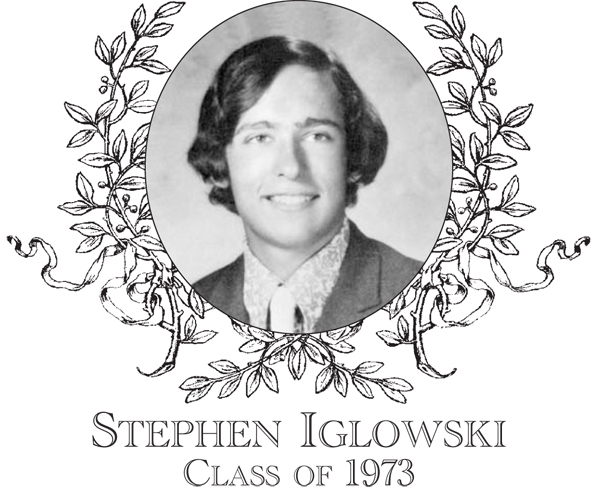 Steve Iglowski, Class of 1973, was a two-sport athlete who participated in both basketball and baseball. Steve had plenty of natural athletic talent, but it was his great positive attitude and work ethic that really distinguished him among his peers. Steve participated in the newly organized (1969) BHS varsity soccer program during his early years, but experienced some knee difficulties, thus requiring him to forego the fall sport. In the winter, Steve would join a highly successful Bartlett basketball program. Steve was a junior on the Border Conference Championship Team (17-5) and averaged approximately ten points per game. The classy ball handler was exceptional on the fast break and had been a part of the BHS basketball program since his freshman year and was counted upon to be the Indians� playmaker during his senior year. However, Steve sustained an off-season knee injury, which required knee surgery and was lost to the team for his entire senior year. The 1973 team would eventually become Border Conference Champions as well as the BHS first-ever Clark Tournament Champions. In the spring, Steve had an opportunity to play his favorite and strongest sport � baseball. The legendary Ziggy Strezlecki coached him. Steve was a four-year member of the varsity team, excelling in both hitting and pitching. In both his junior and senior years, he led the team in hitting. His pitching skills matched his outstanding hitting and he recorded twenty-five wins over a three-year period. He was noted for his command of his pitches and his mental toughness on the mound. In his senior season, he captained the team and led the Indians to the 1973 MIAA District Championship. He was named to both the Border Conference and Worcester Telegram and Gazette All-Star Teams, to go along with his two baseball MVPs which he won in both his junior and senior years. While at Bartlett, Steve was an excellent student achieving honor roll status for all four years and participated in many extracurricular activities. Steve would graduate from Providence College with a degree in Accounting and followed it with an MBA from Nichols College. He is presently employed by the Raytheon Company as Director of Global Cash Management. Steve and his wife Nadine live in Auburn, and they have two sons, Andrew and Adam.